These three platform mounds, an adjacent ceremonial plaza and associated habitation areas mark the political and religious capital of the Natchez Indian chiefdom of the late 17th century and early 18th century. A number of French colonists who witnessed the use of the mounds at Grand Village recorded their observations. These 18th-century accounts offer a rare firsthand glimpse of mound ceremonialism, by then a nearly extinct holdover tradition from the precontact period. 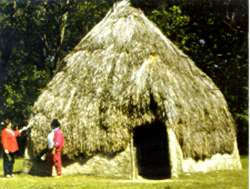 The paramount chief of the Natchez, called the Great Sun, lived at the Grand Village. The French accounts describe both the Great Sun's house, which stood on Mound B at the center of the site, and a ceremonial temple, which stood on Mound C, the southernmost mound of the group. Within the temple, a sacred perpetual fire was kept burning day and night. Foundation remains of both the Great Sun's house and the temple were discovered during 1962 archeological excavations of the mound. Mound A, at the north end of the site, apparently was no longer in use by the time European chroniclers arrived. The mounds, which stand about eight feet high, rose in several stages as the structures that stood on top of them were demolished and rebuilt in accordance with ceremony. Elaborate funeral ceremonies for the Natchez elite were conducted on the mound plaza. These rituals included the sacrifice of relatives and servants of the deceased. Natchez pottery vessels, as well as European trade goods obtained from the French, accompanied the dead. Two of the burials may have been those of the Great Sun, whose death in 1728 is mentioned in the historical sources, and his brother and war chief Tattooed Serpent, whose 1725 funeral was recorded in detail by the French. Increasing French confiscation of Indian lands led to rapid deterioration of Natchez-French relations following the death of the Great Sun. The Natchez attacked nearby Fort Rosalie in 1729, killing most of the French garrison there. In response, the French organized a retaliatory expedition in 1730. They and their Choctaw Indian allies occupied the Grand Village, using the location to lay siege to the Natchez, who had withdrawn into stockaded fortifications to the south. During the siege, French troops used the central mound, formerly the site of the Great Sun's house, as an emplacement for their artillery. This confrontation marked the beginning of the destruction of the Natchez as a nation. Although the siege failed to force their surrender, the Natchez permanently abandoned their traditional territory as a result of it. Fewer than 300 of the Natchez eventually were captured by the French and sold into slavery in the West Indies. The remainder escaped to join other tribes as refugees. Today, people of Natchez descent live among the Creek and Cherokee Indians. The Grand Village of the Natchez Indians, designated a National Historic Landmark, is maintained as a park by the Mississippi Department of Archives and History. The museum exhibits artifacts excavated from the site and sponsors public education events and activities. The Grand Village of Natchez Indians, is located in Natchez. Turn east off US Hwy. 61/Seargent S. Prentiss Dr. onto Jefferson Davis Blvd., just south of the Natchez Regional Medical Center. Proceed on Jefferson Davis Blvd. a half mile to the entrance gate on the right. It is open Monday-Saturday 9:00am to 5:00pm, and Sunday 1:30pm to 5:00pm, free admission. Visit their website or call 601-446-6502 for further information.